Have just a few minutes for some solving fun? This collection of 125 small, easy crosswords is just the thing! 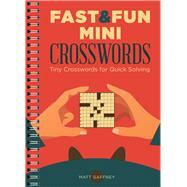 Mini crosswords, mini themes . . . and maximum enjoyment! When you don’t have enough time to get involved in solving a lengthy, challenging puzzle, these crosswords provide a perfect brief brain workout. Created by a top-notch constructor with just the right amount of challenge, they’re proof that bigger isn’t necessarily better! Matt Gaffney runs a popular weekly crossword contest online. He also writes a crossword for every issue of New York and The Week magazines.